In a new study, researchers at the U.S. Department of Energy's (DOE) Argonne National Laboratory, together with collaborators in France and Russia, have created a permanent static "negative capacitor," a device thought to have been in violation of physical laws until about a decade ago. "The objective is to get electricity where it is needed while using as little as possible in a controlled, static regime," said Argonne materials scientist Valerii Vinokur, the corresponding author of the study. "One way you can think about it is like having a refrigerator," said University of Picardie (France) scientist Igor Lukyanchuk, the first author of the paper. "Inside the refrigerator, of course, it is much colder than the outside environment, but that is because we are heating up the rest of the environment by expending energy to cool the refrigerator." "In a ferroelectric nanoparticle, on one surface you will have a positive charge, and at the other surface you will have negative charges," Vinokur said. "This creates electric fields that try to depolarize the material." Because of the cylindrical nature of the nanoparticle, the domain wall began to shrink, causing it to displace beyond the new electric equilibrium point. "Essentially, you can think of the domain wall like a fully extended spring," said Lukyanchuk. "When the domain wall displaces to one side because of the charge imbalance, the spring relaxes, and the released elastic energy propels it further than expected. This effect creates the static negative capacitance." 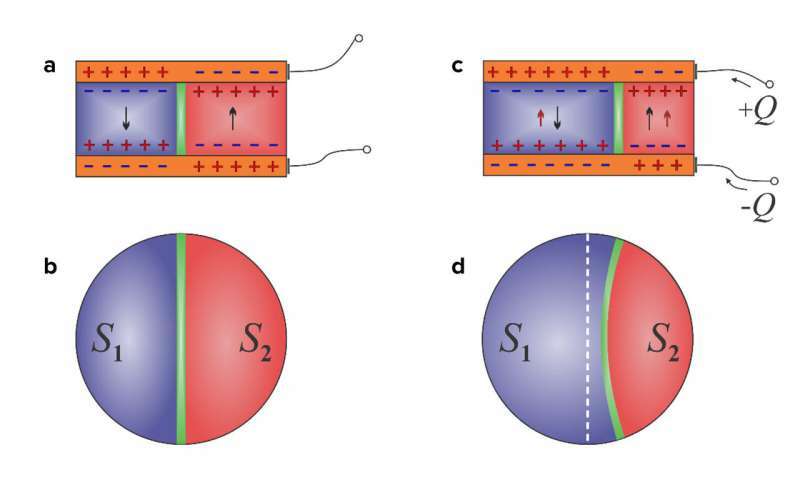 An article based on the study, ​"Harnessing ferroelectric domains for negative capacitance," appeared in the February 26 online edition of Communications Physics. Authors of the study also include Anaïs Sené of the University of Picardie, and Yuri Tikhonov and Anna Razumnaya of the Southern Federal University (Russia).